Part of a series of works exploring the love stories of others. When was the last time you said I love you? examines how we talk about love, fixing on the words we use to talk about this most intimate of emotions and refracting them through an artificially staged sequence of performances to create a series of ever-shifting narrative canvases. Constructed from hundreds of responses to an online questionnaire about love, the scripts for the films were performed by a group of older actors from an amateur rep company, each actor performing in isolation in a blacked-out studio and directed to address the camera. Through the subsequent edit, these performances have been moulded to form a series of dialogues, staged conversations‚ about private experiences. One of the primary concerns of the films is language: the words we use to talk about love. 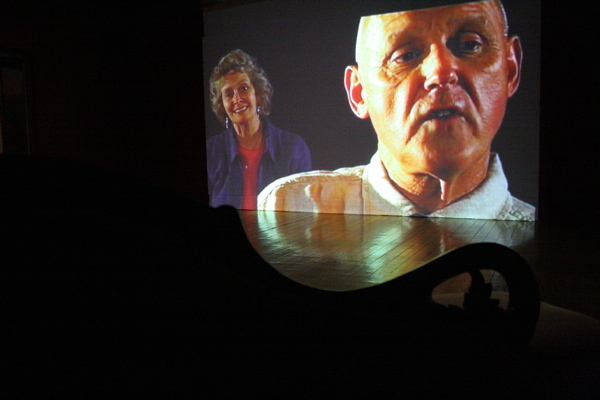 The questionnaire format demands the telling of stories – How did you propose?‚ – ask respondents to provide descriptions – Describe the love of your life‚ – even to use the words of others – Do you have a special love song?‚ – resulting in an encyclopeadic collection of responses that range from the heartfelt to the jokey to the cliched, but which all share a commanality – the fact of being a written, considered response. Once put into the mouths of others, these anonymous written responses are asked to take on the role of performed dialogue , and the disjunction between their origin of these words and their subsequent theatrical performance creates a distancing effect that lends the work an air of artificiality. The viewer becomes aware that what they are seeing is an act – far from spontaneous outbursts of feeling, these lines are practised, staged, rehearsed. The use of older actors from an amateur rep company also adds to this effect, it becoming apparent through the films that the experiences they are presenting as their own, belong in fact to other people. 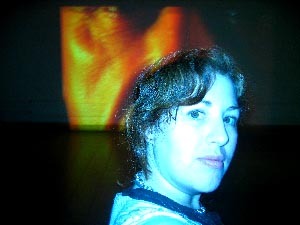 The films also call into question the shifting, mutable nature of how we feel about love – within the space of a few cuts, the actors change opinions, recount contradictory experiences and beliefs, suggesting that what they might be performing are the stories of a lifetime, the cumulative histories of their love-lives. 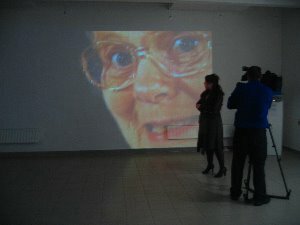 The films were commissioned by web broadcast channel Moonradio, funded by an Arts Council of England digital bursary, and have been designed specifically to be viewed online. This morning. Last night . Many years ago. Today. In my thoughts today… . Only a few minutes ago, when I was brought a cup of tea after work. …in reality, 1999. 3 years ago . 2 days ago. To the man I loved, when I was 18… . I don’t remember …to my parents and family, this last weekend . It is a term to be used sparingly and truthfully, given the effect it can have …to my mates, the last time I was pissed. To an adult, 6 years ago… Christmas. He drove me to the airport the last time I saw him and I told him I loved him. Two weeks later I broke up with him. I needed more than he knew. His silences were eating me alive. Last time I rang my sister… This morning before work …She always makes me say it when putting the phone down. An hour ago A month ago . Everyday of our relationship . Last night, 2 am . Never . I’m rationing I love you’s.